We are the well-known manufacturer and supplier of supreme quality range of Plastic Bin that is crafted and designed using excellent quality raw material and looks stylish with its smooth finish. 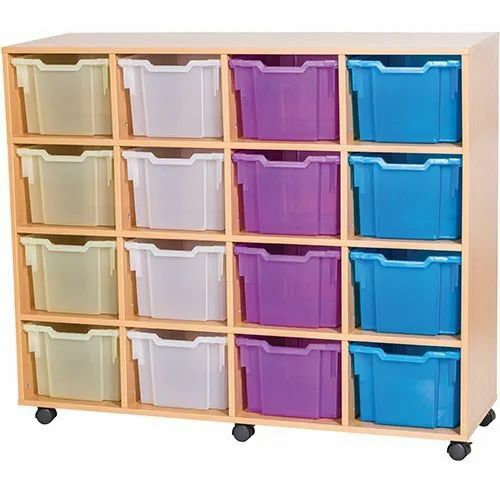 This offered plastic bin provides abundant space to store small items in least amount used space. This offered range is presented in interesting designs, shapes and colors and is widely admired by our prestigious clientele and in the industry. Moreover, the product can also be made to order as per the needs of the patrons at pocket-friendly prices. City Storage Systems, one of the leading manufacturers and suppliers of this impeccable range of Storage Equipment & Trolleys, established its operations in the year 1993. This impeccable range is known to be made up of the finest Storage Racks, Slotted Angel Racks and Two Tier Racks, having a high demand in the market. Making of this range done as per the set industry norms and guidelines, utilizing the finest raw materials and modern machines, owing to this, the product is known to have an impeccable sturdiness, durability and resistance to corrosion. Further, the range is marked at the most reasonable rate possible. In order to maintain our position in the market, we keep upgrading our infrastructural facility on a highly regular basis. The facility laced with all the necessary machinery and equipment, helps us in the attainment of a number of the firm’s predefined goals and targets. For reasons of managing the operations of the firm, in the best possible manner, the facility has been parted into a number of highly operational units. These units, helps us in the maximization of the firm’s production capacity. In addition to this, our abidance of the industry guidelines and ethics, have helped us generate a huge client base comprising of Atash Industries Ltd. Palghar, Elegant Pharmaceuticals Ltd. New Mumbai and Vitara Pharmaceuticals Ltd. Mumbai.